More than three decades after the first cases were reported, HIV is still a leading cause of death and a health threat to millions worldwide. The world has the tools needed to control the HIV epidemic and lay the groundwork for ending this disease. However, many people are not benefiting from the latest scientific advances. Controlling the HIV epidemic requires effective treatment and prevention programs for unreached and vulnerable populations. As a key implementing partner of the U.S. President’s Emergency Plan for AIDS Relief (PEPFAR), CDC works side-by-side with ministries of health, civil and faith-based organizations, private sector organizations, and other on-the-ground partners to improve methods for finding, treating, and preventing HIV. The investments made to fight HIV today will save lives and strengthen long-term economic sustainability. December 1 is World AIDS Day. 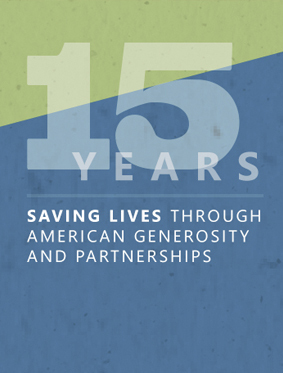 This year, the U.S. Government’s theme, Saving Lives Through American Generosity and Partnerships, highlights the transformational impact of PEPFARExternal, which has saved more than 17 million lives through the generosity of the American people and our partnerships with countries, communities, and many others around the world. This is an urgent moment in the history of the HIV response. Results from the CDC-supported Population-based HIV Impact AssessmentsExternal demonstrate that investments to control the HIV epidemic are working in several African countries. These survey findings also highlight that more work is needed in certain places and with certain groups. Reaching men with targeted HIV testing and treatment programs is key to controlling the HIV epidemic. As a key implementer of PEPFAR, CDC has played a leading role in helping to accelerate global progress towards controlling and eventually ending the epidemic. Learn more about CDC’s impact in the fight against HIV, read our latest research, hear stories from CDC experts on the frontlines, view a message from the directors of CDC’s Center for Global Health and Division of Global HIV & TB, and download shareable resources. Learn more about CDC’s innovative, data-driven approach to control the HIV epidemic around the world in the videos below. Adolescent girls and young women in Eastern and Southern Africa are disproportionately affected by HIV. This video explains how CDC is reaching young, at-risk girls with mentoring and skill-building programs. This video describes an innovative strategy that CDC is using to find undiagnosed HIV-positive people, and helping these individuals to access HIV testing and treatment services. In sub-Saharan Africa, men are less likely than women to know their HIV status, seek life-saving HIV treatment, and reach viral suppression. This video discusses how CDC is tailoring HIV treatment and prevention programs for men. CDC has developed and is evaluating a simple, rapid test to simultaneously diagnose HIV and identify recent infections. This video explains how the test is helping to accelerate controlling the HIV epidemic. This video describes how CDC is scaling up viral load testing – a measure of the amount of HIV virus in the blood – to monitor the health of people living with HIV who are receiving antiretroviral treatment. Shareable social media graphics that highlight the burden of HIV, global progress to date, and CDC’s leadership to help end the epidemic. The PEPFAR15 page describes how for fifteen years, CDC has played a critical role in PEPFAR’s efforts to save millions of lives across the globe. The HIV overview provides a historical look at CDC’s leadership, reach, innovation and impact in the global fight against HIV. The HIV fact sheet shows the burden of HIV worldwide and CDC’s efforts to address the epidemic.